One of Falmouth's oldest pubs, The Grapes was founded in the 1700s and, situated on Fish Strand Quay, has traditionally been the destination of choice for the seafarers, merchants and Navy-men whose ships are docked in Falmouth's stunning harbour which this pub overlooks. One of Falmouth’s oldest pubs, The Grapes was founded in the 1700s and, situated on Fish Strand Quay, has traditionally been the destination of choice for the seafarers, merchants and Navy-men whose ships are docked in Falmouth’s stunning harbour which this pub overlooks. 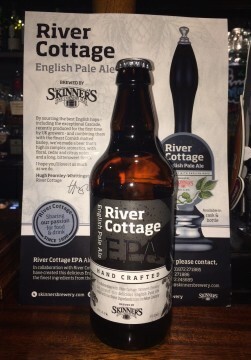 The beautiful panoramic view from the back of the pub is a perfect location to enjoy a great drink from the pub’s very extensive range; with over 80 spirits and liqueurs across the back bar and a great range of lagers and local real ales and ciders – there is something for everyone. The front of the pub faces onto Falmouth’s busy high street and located right in the centre of town. 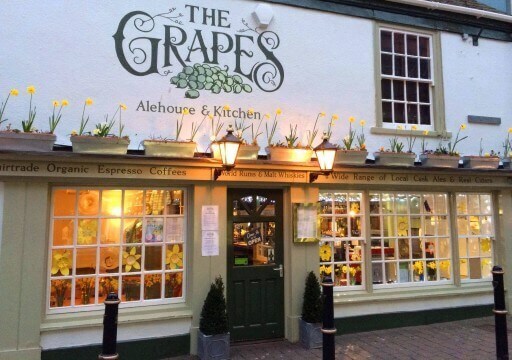 The Grapes is a great place to drop by during the day – espresso coffees and a range of teas are available as well as a full brunch, lunch and afternoon food service. Main meals are also available here at lunch and dinner time; all our food is locally sourced and home made by our kitchen team which is headed up by our highly experienced Chef, Keith Webb. The Grapes is also hosts a series of evening entertainments including our regular Wednesday night Quiz, ‘Folk Thursdays’ and ‘Friday Night Live’ featuring the best of local musical talents. A full schedule of evening events are on our Facebook wall. So come down to The Grapes! All are welcome – we’re family friendly and we accept well behaved dogs too. See you soon….